Bottom of the smoke tank with the smoke line going back to the pump under the header tank. 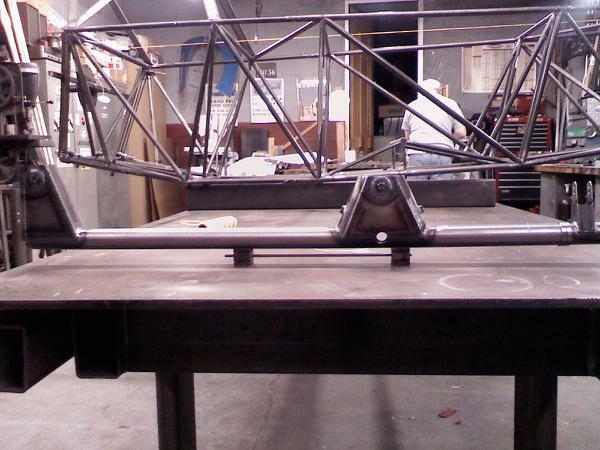 Tonight we moved the fuselage to the table. 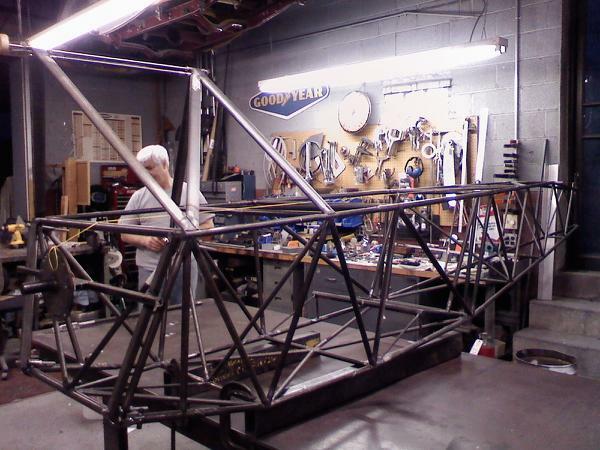 This weekend we are going to bring the lower wings to Dave’s shop and set them up so we can tack the lower wing attach fittings. 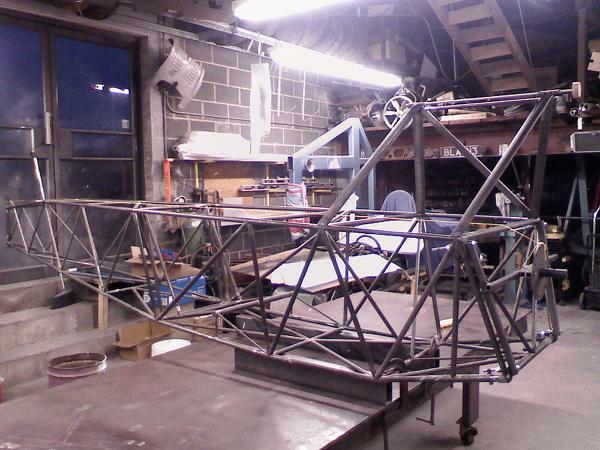 I can’t wait to see the lower wings with the fuselage. 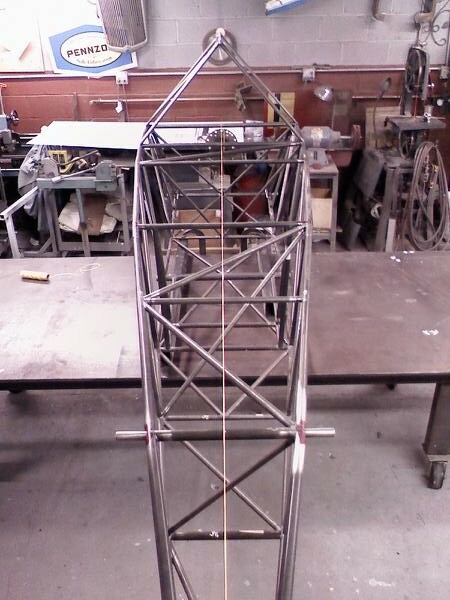 Here are some more pics of the cabanes and fuselage. 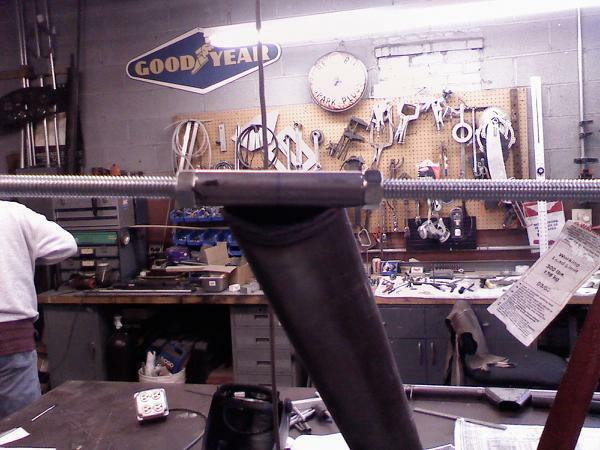 Also two pics of the finished Torque Tube, that came out really nice! 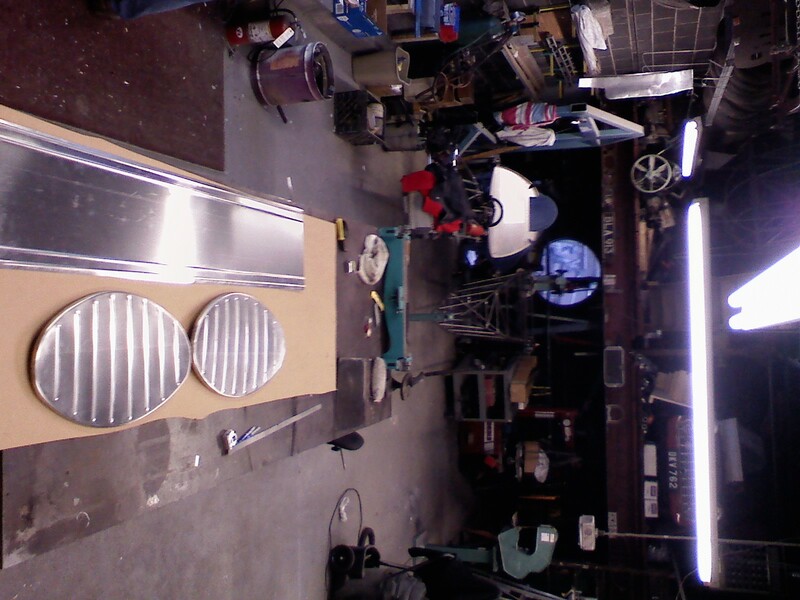 Sunday we tacked up the fuel tank. We took the two pieces we cut out to form the ends and screwed a spacer between them so that we could use them as a former to hold everything together. You can see it in the picture below. 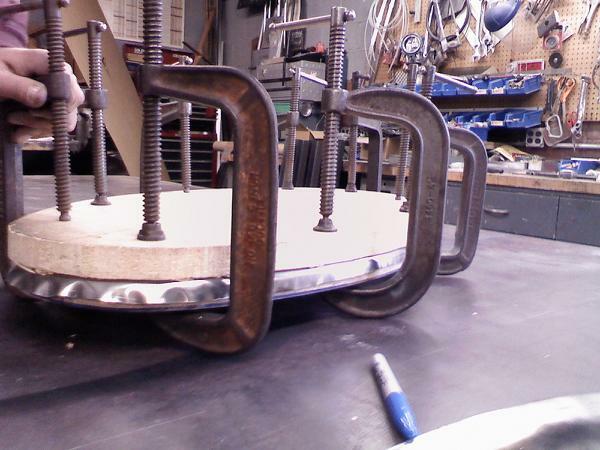 Here is the tank, strapped around the jig and the start of tacking the ends on. 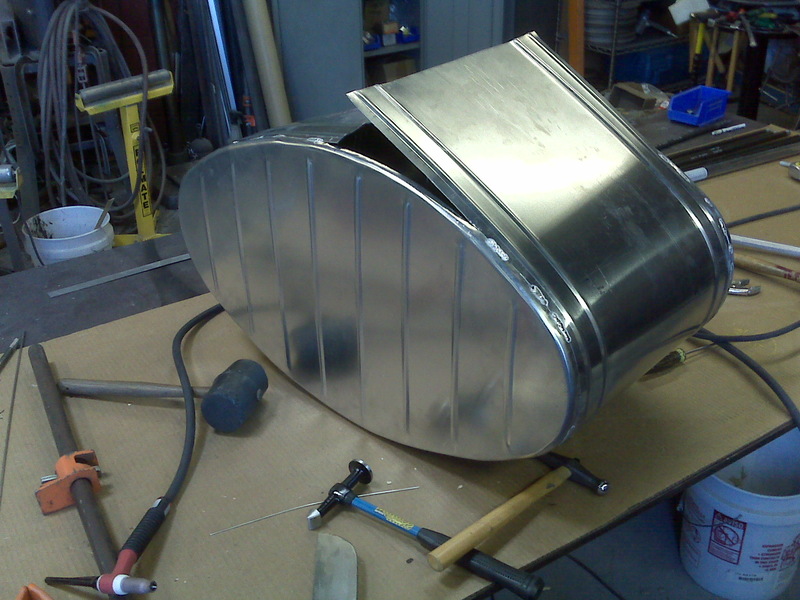 Here is the tank all tacked up. Next steps filler neck and fittings! Every time I work with Wayne or Dave I realize how impossible this project would be without them. I never imagined how much I would be learning, about so many things, and today(1/24/08) would be no different. A quick recap: I spent Saturday morning with Wayne. 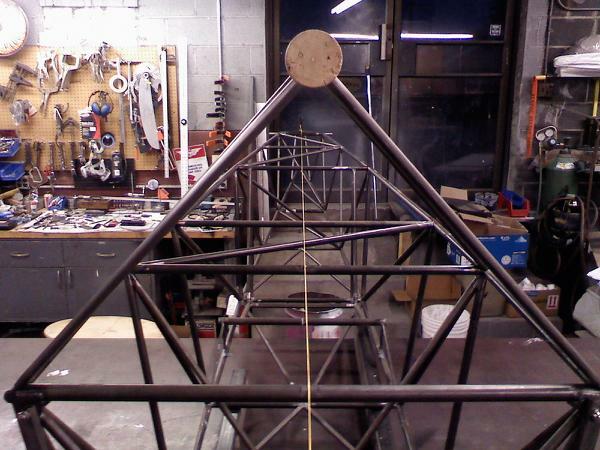 We finished up drilling and installing the left wing attach plates and angles. 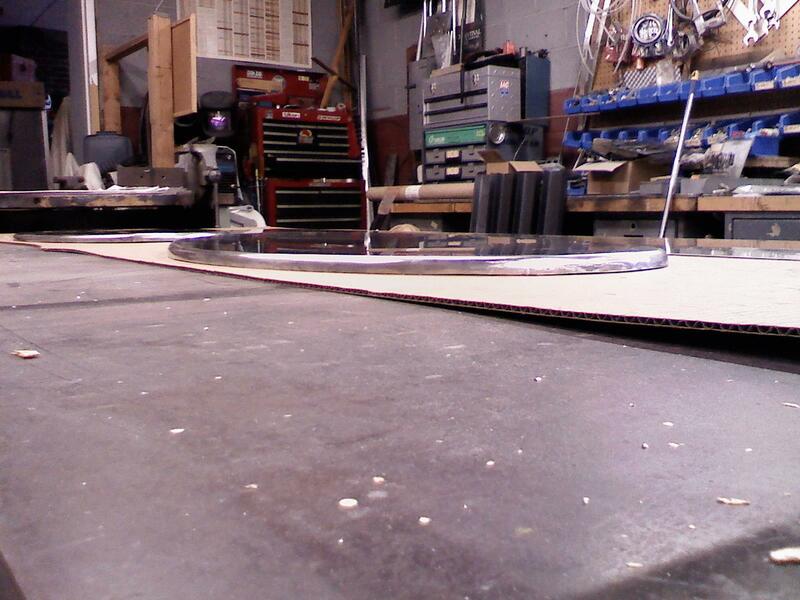 We also cut the plywood for the wing tips. 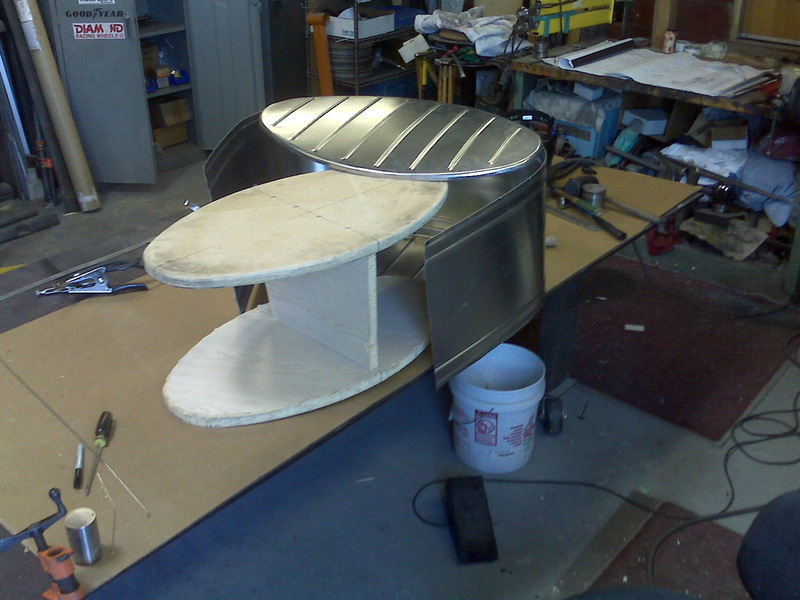 Things are progressing along nicely. So today I met Dave down at his shop. 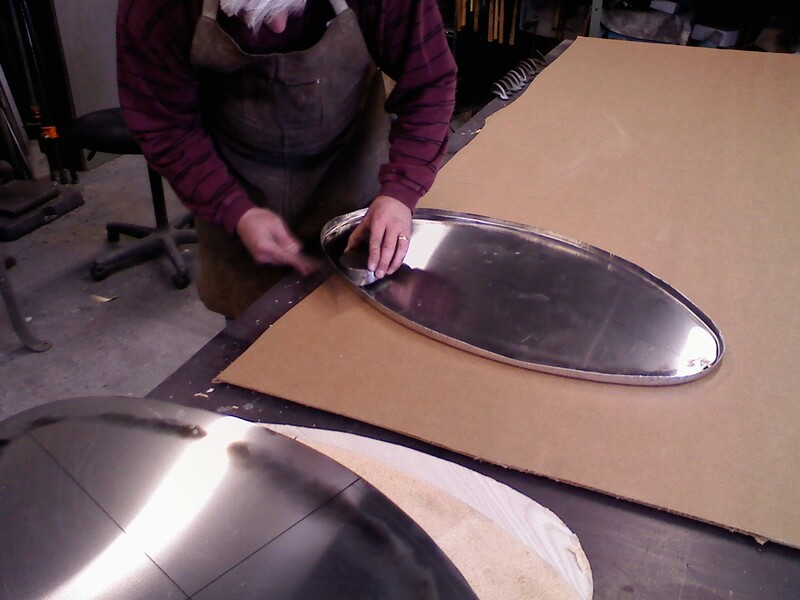 When I walked in, Dave was cutting out the templates we would use to draw, shrink and form the ends of the fuel tank. 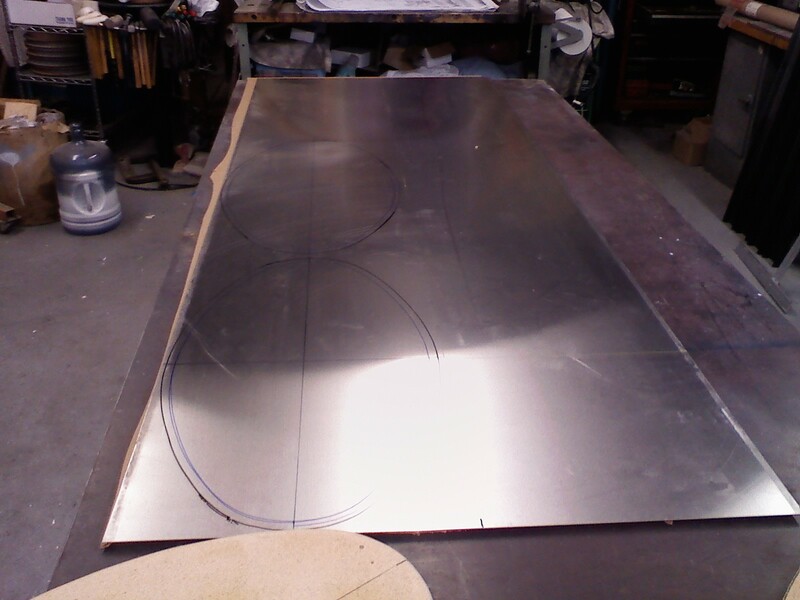 We traced out the form on the aluminum and added a 3/4 extension to it. 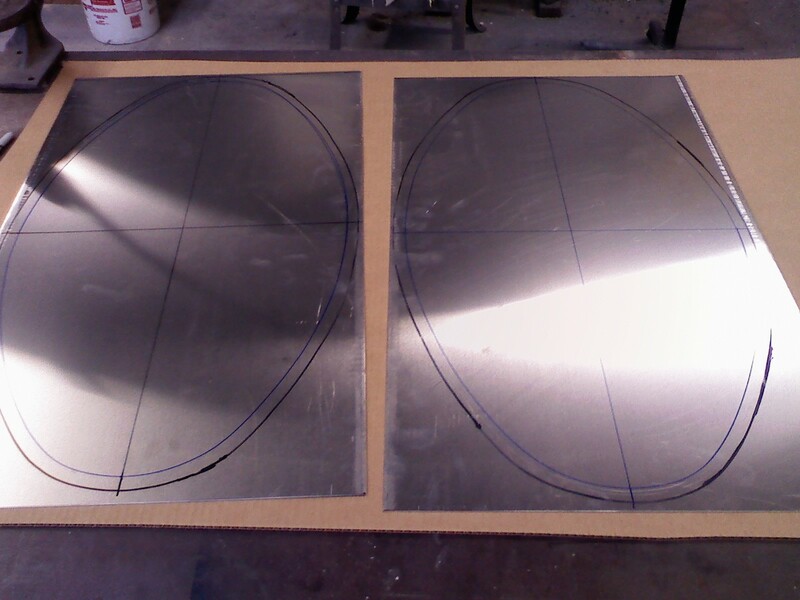 We sheared the two tank ends and are ready to rough cut the outside line. 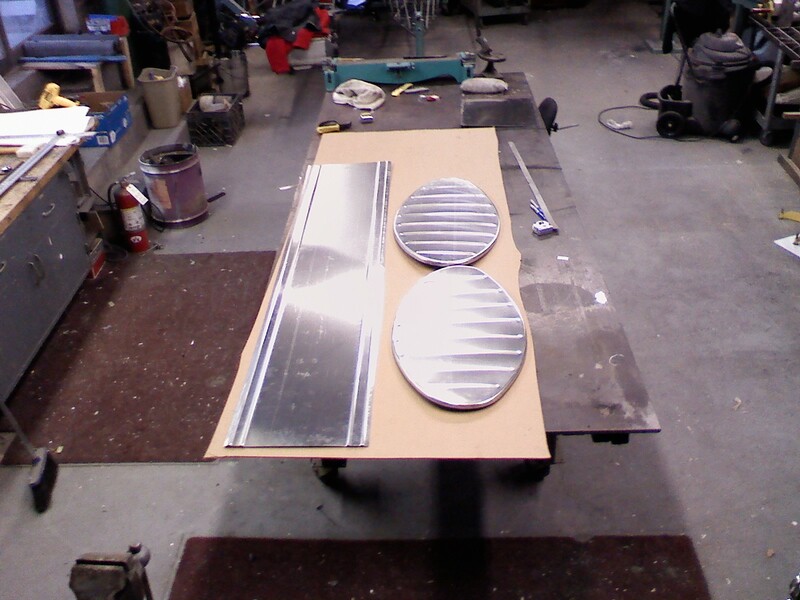 One of the nice things about working with Dave and Wayne, beyond their expertise, is that they have all the tools! The right tool makes all the difference. 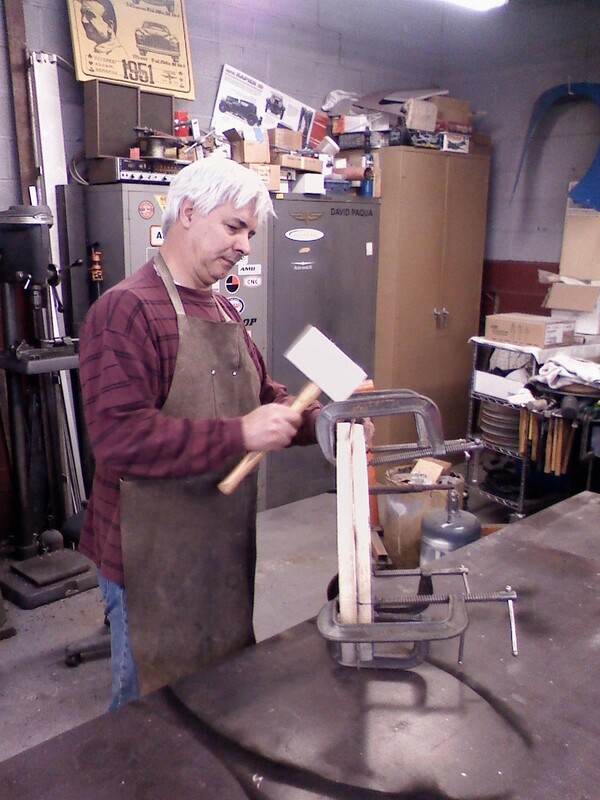 Here’s a pic of Dave using a Beverly Shear. It makes short work out of cutting these out. 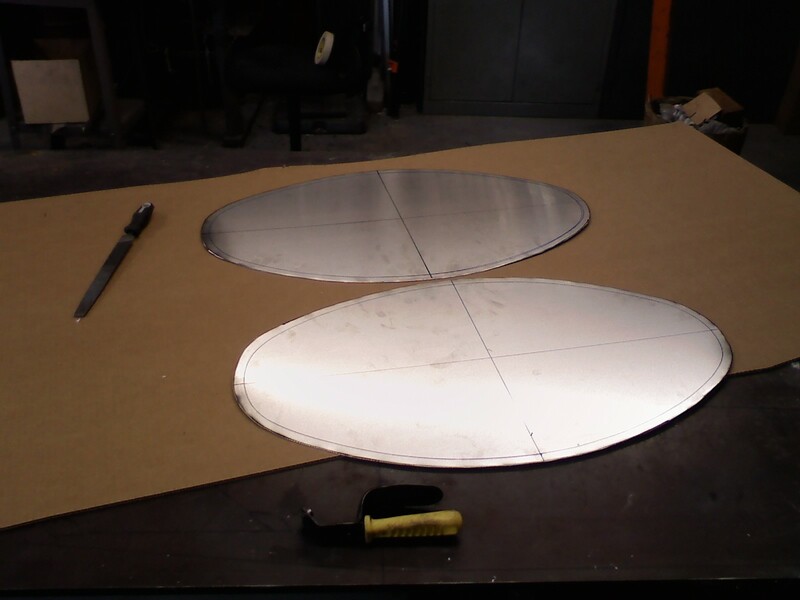 The next step is to anneal the edges so it is easier to form and shrink the normally very hard aluminum. 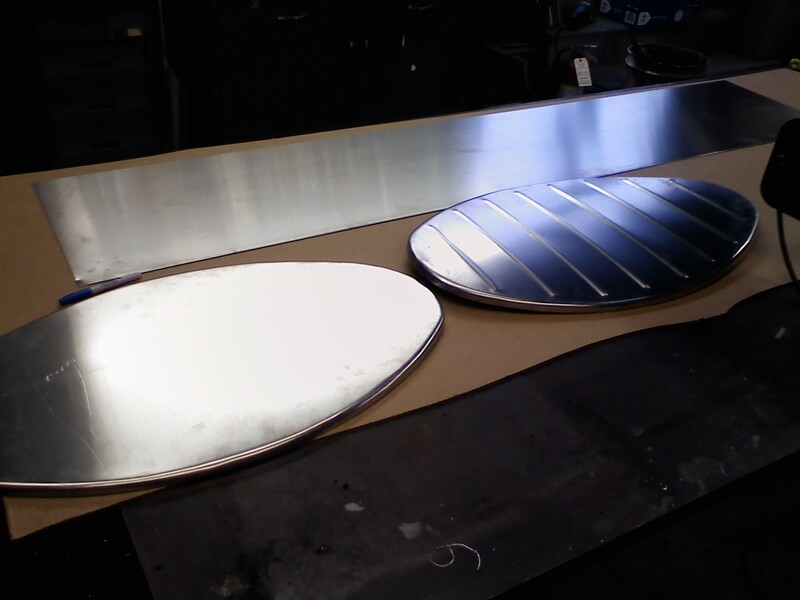 In essence you need to heat the aluminum to a specific temperature to temporarily soften it. The trick is to get the right heat on it. 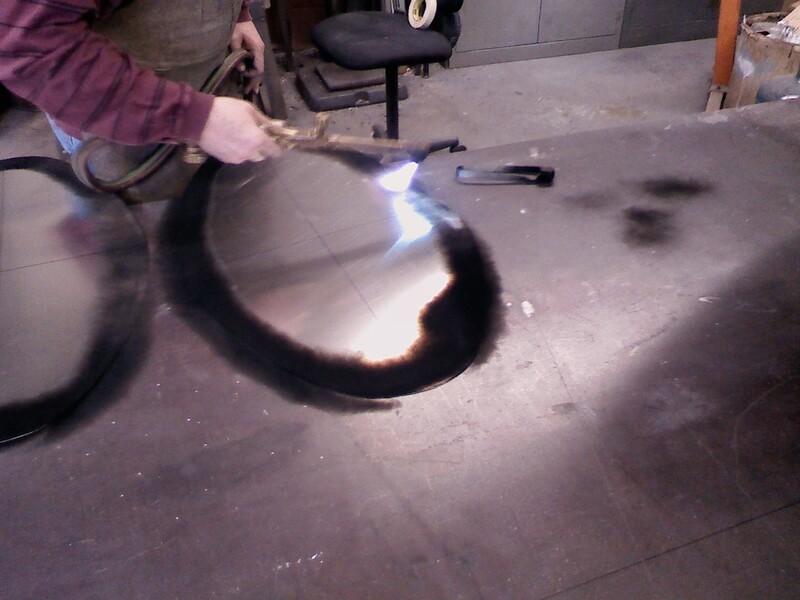 One way to do this is called the Torch Soot Method. 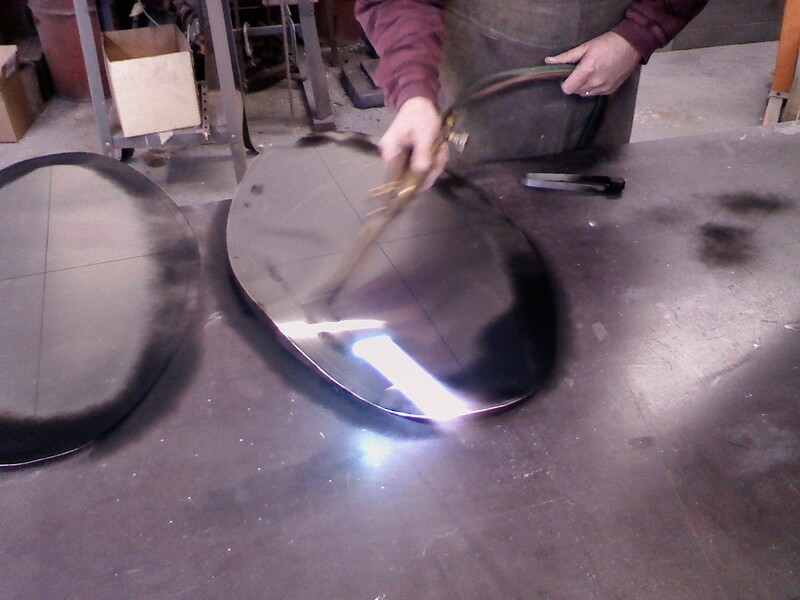 If you have ever put a flame to aluminum or the like you notice it puts a black film on the surface. If you run a torch over the sooted area, the soot will burn off. 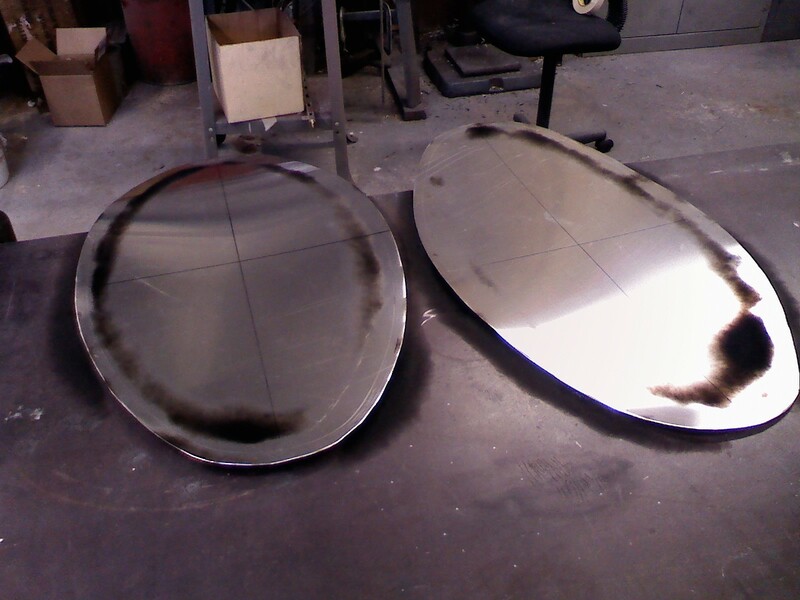 The heat needed to burn off the soot, just happens to be the right amount to anneal the aluminum. This is a great article explaining it. 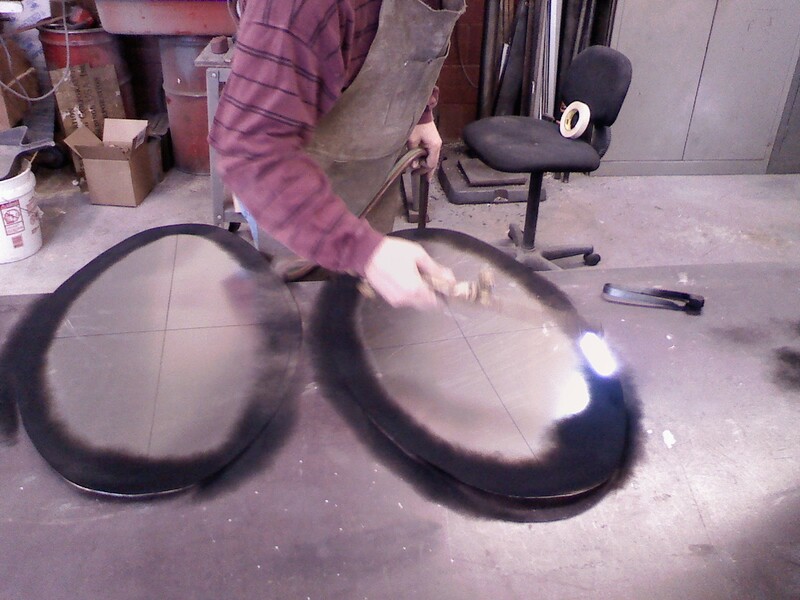 Here is Dave applying the soot indicator. Now he is burning off the soot. 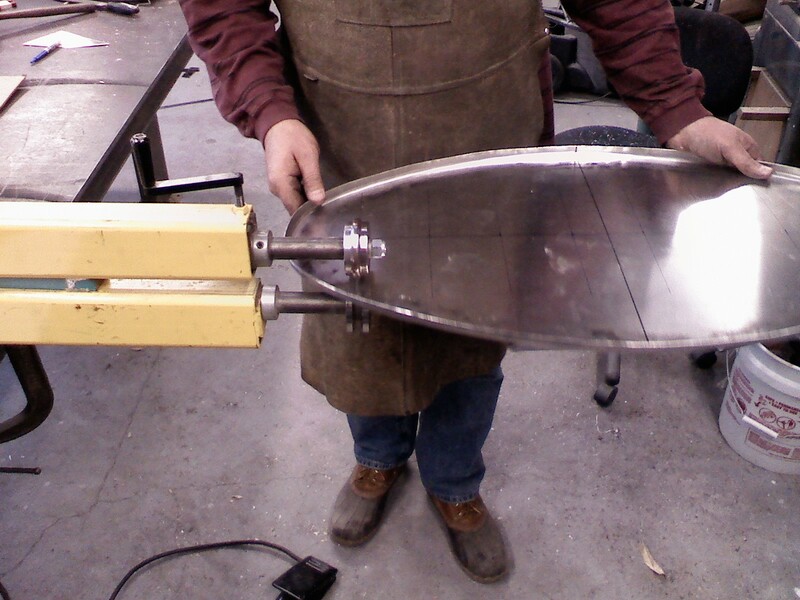 Next we need to form the end of the tank. 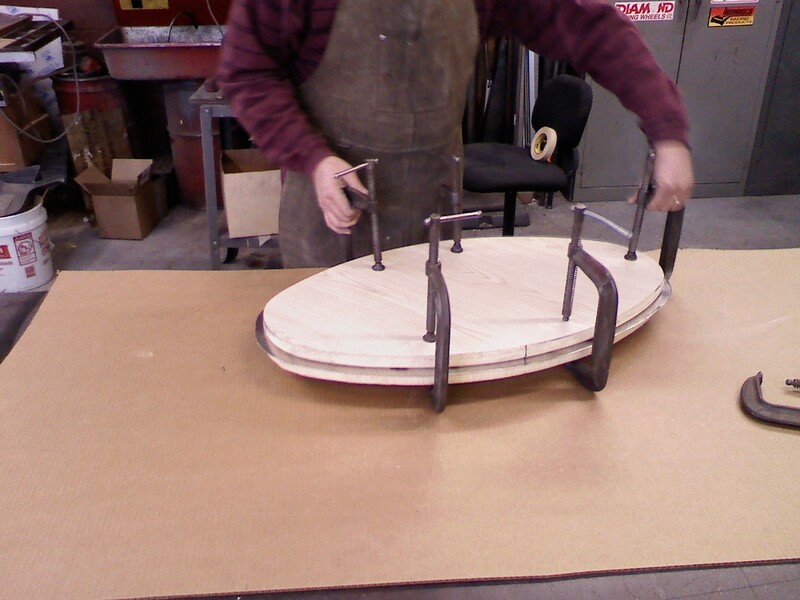 We clamped the sheet between the two wood cutouts. One is the former, that we will bend the edges around to give it the shape we need. The other holds it in place while we do this. 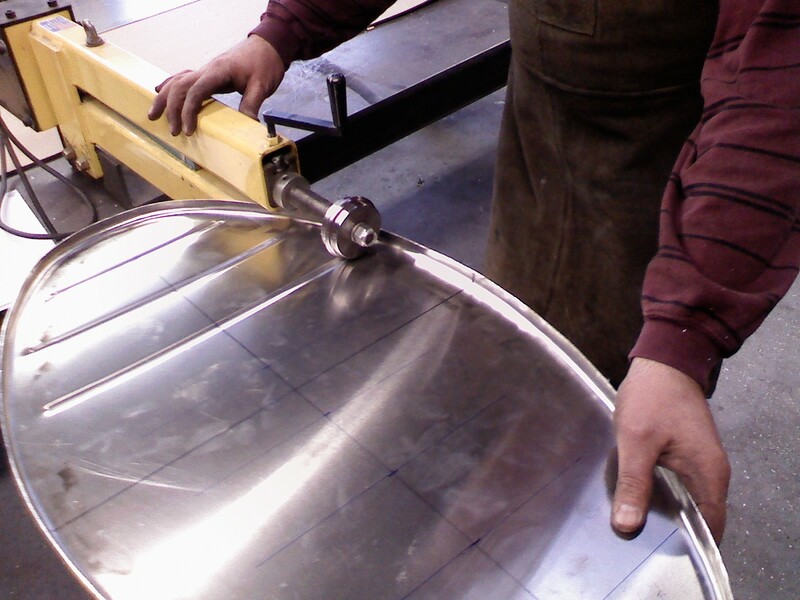 With the aluminum sheet tightly in place, we use some persuasion to shrink and form the edges of the tank end. A great analogy Dave told me, was to think of the metal as putty that you hammer into shape. 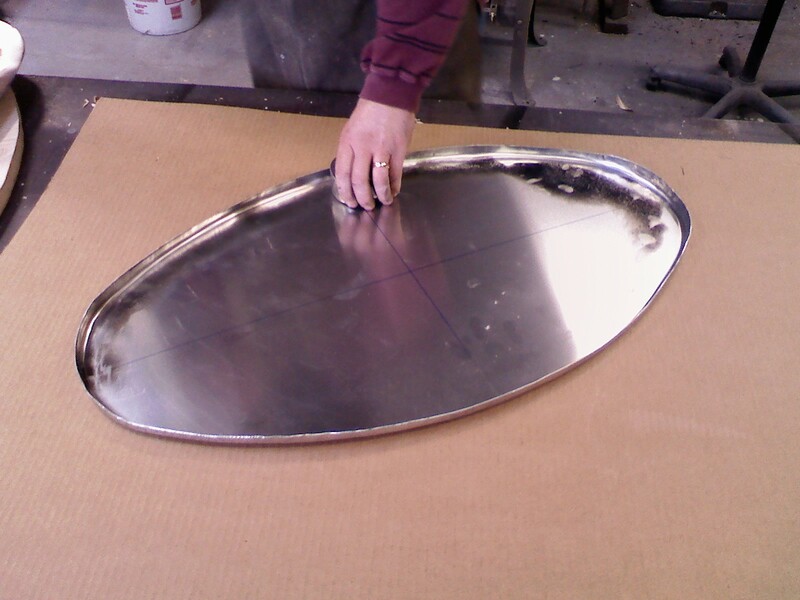 And as you pound the aluminum, shrinking and forming it into the shape that is exactly what it works like. 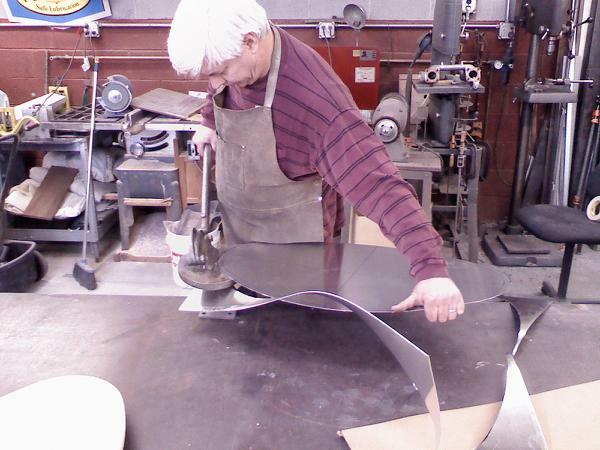 It is amazing how the metal sort of flows into shape. With the Edge nicely beat into submission, it is time to take it out of the former. No to shabby! 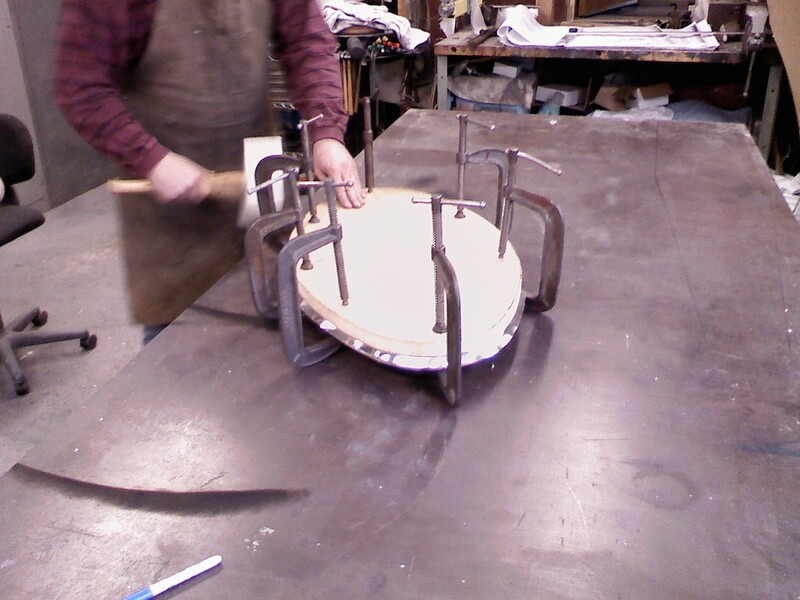 Now Dave will use a hammer and bucking bar to clean up the shape and smooth any imperfections out. After watching Dave, it was my turn to take a whack at it. 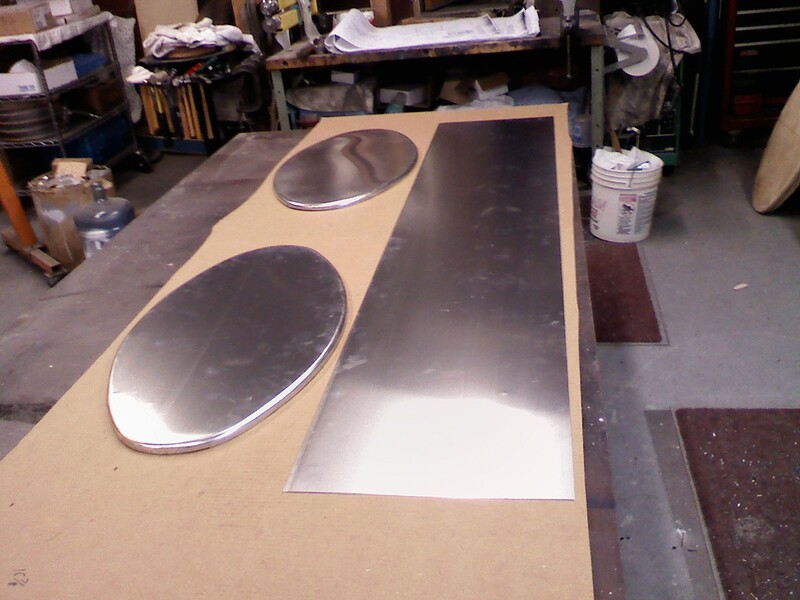 😉 Here are the two ends pounded into shape. 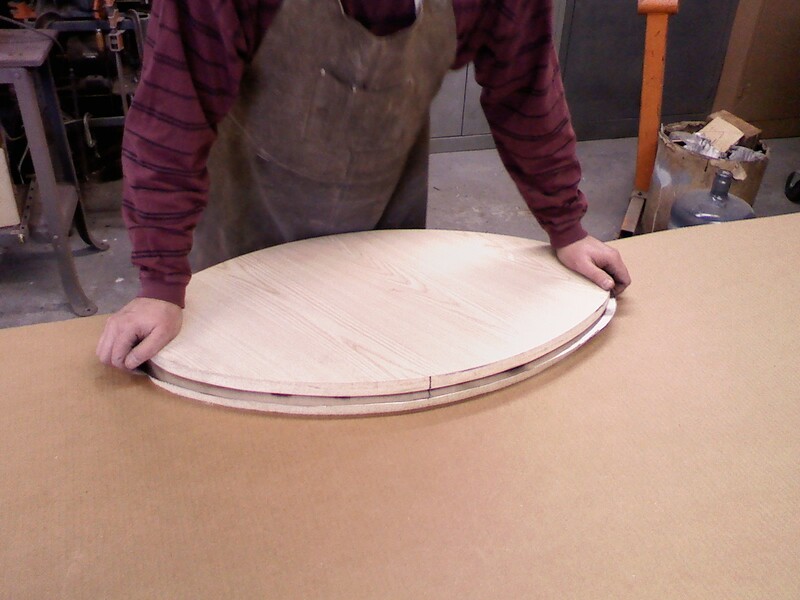 Now we need to add strength to the pieces. This is achieved by rolling a bead into them. Once again, it’s nice to have the right tools for the job! 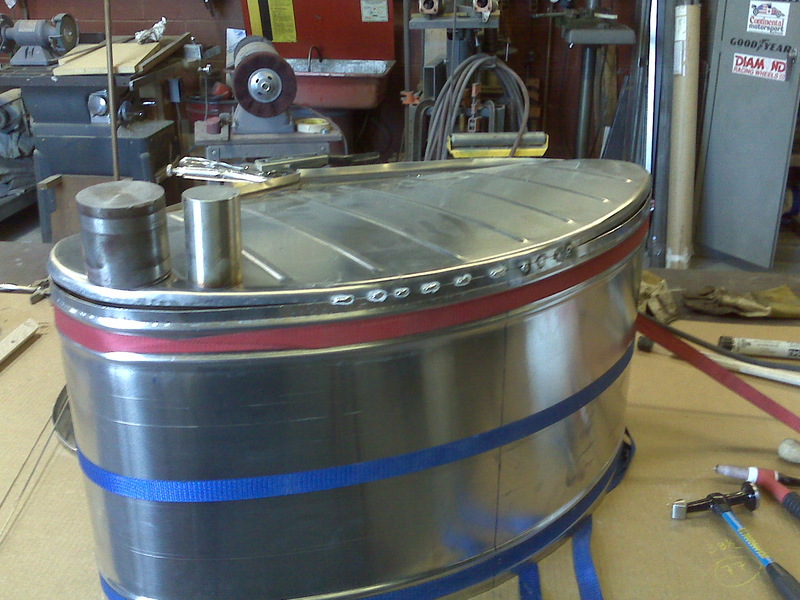 And finally here are the two ends and the body of the tank. 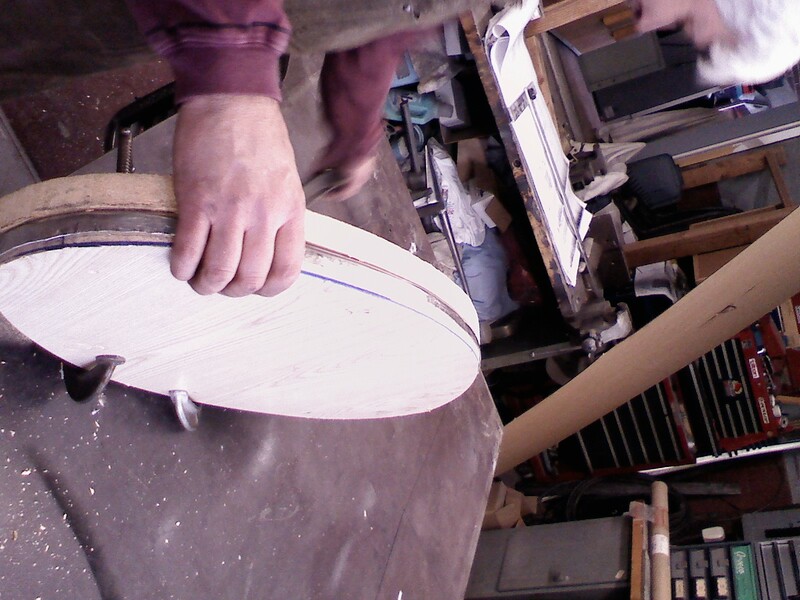 The next steps are to roll the body into shape and then tack the ends on. 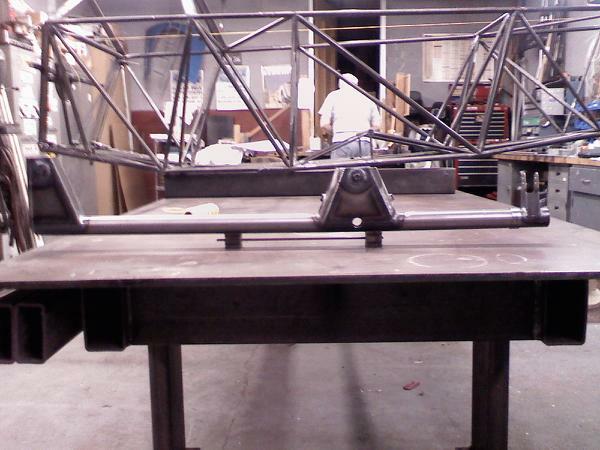 Finally, we’ll cut and weld in the filler neck and fittings. 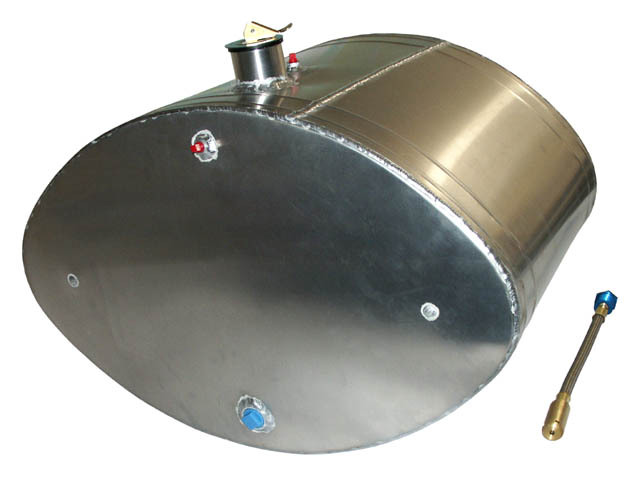 This is a similar tank and what ours will look like.